Banana leaves can normally be found in most grocery stores- fresh or frozen. If frozen they only take about 15 minutes to thaw and work just as well as fresh. They make an excellent steaming vessel as they keep all of the delicious juices right where they should be- in the salmon! Mix all ingredients EXCEPT peppers and tomatoes. Coat salmon in mixture and let sit to marinate in the fridge for about an hour. 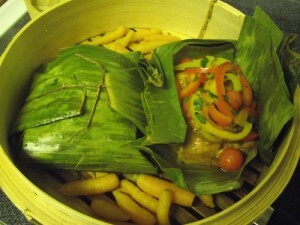 Place salmon in middle of banana leaves and pour over remaining liquid and top with peppers and tomatoes. Fold over banana leaves to make a tight parcel. Place in steamer over boiling water for 5-6 minutes. Discard banana leaves for serving or use as garnish on plate.